We have already covered a number of new Heritage pieces from Longines this year such as the Column-Wheel Single Push-Piece Heritage Chronograph, Pulsometer Chronograph and Heritage Diver 1967, but these weren’t the end of Longines’ 2015 story. For those who are more into the military-inspired watches from Longines’ rich past and who have perhaps not found other recent pieces quite to their preferences, here is a new proposition for you. For those acquainted with with vintage military watches, the dial will immediately be familiar to you. 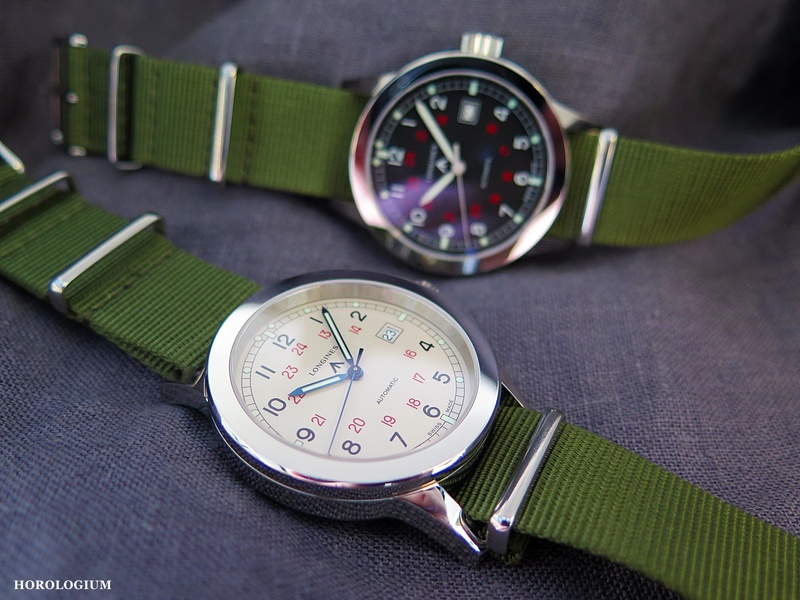 The new Heritage Military COSD is based on watches issued to British Military personnel at the end of WWII by the Company Ordnance Supply Depot (COSD) for use in airbone military units. It comes in two variants which, aside from the Longines-esque addition of a date, are both pretty faithful to the original both in features and design. Both of the variants have an inner red 24-hour time scale familiar to many milwatches and a railroad track chapter ring. The cream (or as Longines call it, opaline) dial model has hands framed in blue and the matte black dial one, rhodium-plated hands. There is also the use of Super-LumiNova® dots and batons on the minute railway track, marking hours and minutes. Of particular note is the use of the ‘broad arrow’ on the upper part of the dial, a symbol in use in Britain at the time of the watch’s original issue to indicate government property. It is also a symbol that is much desired by collectors of military watches from the period. The watch is available on either an alligator strap or a khaki-coloured NATO, and there is no question for me that the NATO look is not only the better of the two options but also the one that gives it the best ‘re-issue milwatch’ feel to it. The original used the Calibre 12.68 in a chromed brass case; the modern version is a 40mm polished stainless steel case with a flat bezel that gives it quite a strong presence, and contains the solidly reliable automatic Calibre L619.2 movement (ETA 2892/ A2) with a power reserve of forty-two hours. Water resistance is 30m, which basically amounts to some minor splashing. Air and not sea. Two good looking watches that add to Longines’ rich Heritage collection, these aren’t ‘bread and butter’ pieces but like all other watches in this line, they’re not meant to be; these are modern acknowledgements of pieces that have been historically important to them. If you are looking for an affordable modern military-inspired watch with a very clear design bloodline, then take a look at these. As usual, and I realise I am getting incredibly predictable here, I’d have have probably voted for no date function, but I recognise that many like it in a modern watch. On a NATO strap the Australian RRP (both dials) is $2,225, and on the alligator leather strap, the RRP is $2,500.